April was an incredibly hectic month coming from another hectic month. It was full of tons of reading, lots of stress, and preparation for May. I came straight back from a month ‘vacation’ (where I read about 1 book a day from the library) only to come back and realize that the same schedule had to be adopted for my blog. I am going on my Honeymoon in Scotland in May, so in order to finish all my ARCs for before and during, I had to read 1 book a day. It became a race to the end. So to say I’ve been mostly in stress reading and reviewing mode, is 100 percent correct. 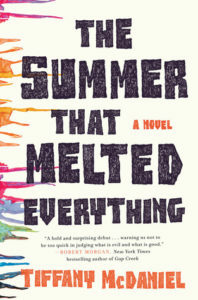 By far, my favorite book for April was The Summer that Melted Everything. It completely shocked me in how amazing and emotional it was! You can read my review above, and then PLEASE go pick up a copy for yourself. Additionally, I was able to snag an interview with the author, Tiffany McDaniel, so look forward to that. I did a lot of damage on my discussion post challenges, not so much on my diversity one. In the month of April. I talked about things that make me want to read a book, and not, why I don’t like star ratings, how my book habits have changed, my ideal book blogger day, blogger expectations versus reality, and I talk about my relationship with fandoms. So I depart for my honeymoon this month, I consider that a future plan. I’ll be less able to respond to comments, tweet, instagram, etc. If you need something urgent, email. And I did manage to get a bit ahead of my reading. So less stress that way! Sorry about the stress reading—that can feel a little crazy! I hope you have a wonderful honeymoon!!! I hope you are enjoying your trip to Scotland! I want to read The Summer that Melted Everything too–it sounds really great.